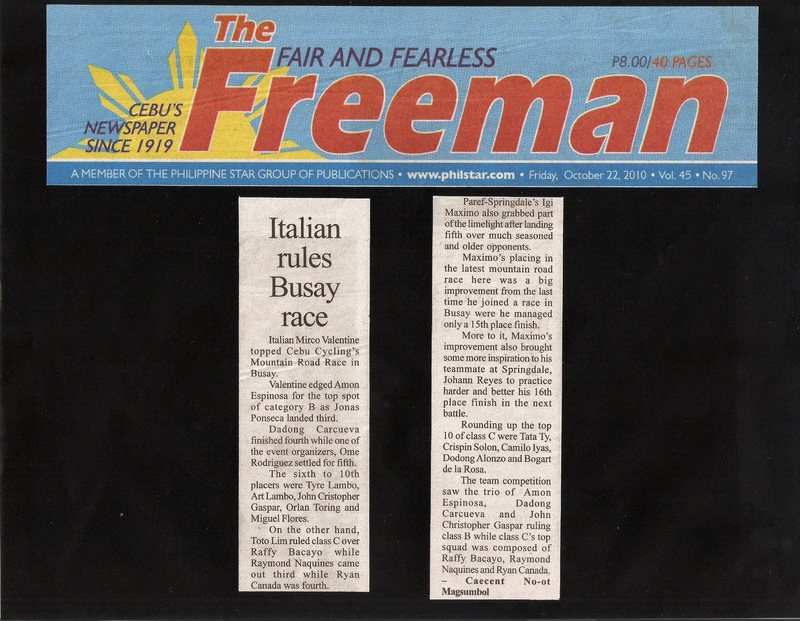 CEBU, Philippines - Italian Mirco Valentine topped Cebu Cycling’s Mountain Road Race in Busay. Valentine edged Amon Espinosa for the top spot of category B as Jonas Ponseca landed third. Dadong Carcueva finished fourth while one of the event organizers, Ome Rodriguez settled for fifth. The sixth to 10th placers were Tyre Lambo, Art Lambo, John Cristopher Gaspar, Orlan Toring and Miguel Flores. On the other hand, Toto Lim ruled class C over Raffy Bacayo while Raymond Naquines came out third while Ryan Canada was fourth. Paref-Springdale’s Igi Maximo also grabbed part of the limelight after landing fifth over much seasoned and older opponents. Maximo’s placing in the latest mountain road race here was a big improvement from the last time he joined a race in Busay were he managed only a 15th place finish. More to it, Maximo’s improvement also brought some more inspiration to his teammate at Springdale, Johann Reyes to practice harder and better his 16th place finish in the next battle. Rounding up the top 10 of class C were Tata Ty, Crispin Solon, Camilo Iyas, Dodong Alonzo and Bogart de la Rosa.